Transferring film to video requires highly specialized equipment and processes. We have some exciting new developments–a new frame by frame system, some new advanced film-specific restoration processes, and a new low-cost option as well. Every job is customized to follow the most effective means of transforming your movies from film on reels into the ideal finished product of your choosing. The Express service (below) takes a shortcut that generally does not compromise the quality of the transfer, but does restrict or eliminate many of the post-production possibilities that make the Archival service so valuable. Choose this if your film is important enough for a very good transfer, but not enough to justify any optional expense. Both lower and higher cost HD options are coming available, and a video to compare them all. Preparation: Cleaning, inspection, and repairs as needed.Optional consolidation of small reels to large. Transfer film direct to the DVD-ready MPEG-2 File format. Compiling and optional basic editing and re-arranging of segments. Optional menu creation with identifying titles and thumbnails. Create master DVD; burn additional DVDs from the master file. Typeset and print title information on all DVDs and load into cases. Choose this if you value your film as important history to be optimally preserved and presented, with further options to improve, edit, and enhance the finished product. 1. Precise and extensive editing and re-arranging of material. 3. Color Correction not only corrects the color problems of various film stocks having been used for both indoor and outdoor lighting conditions, but also corrects for and optimizes the saturation, brightness, and contrast of the film images to the new specifications of digital video. 4. Add Text Information such as names, places, and dates anywhere throughout the presentation. 5. A simple narration track can be a fun way to incorporate stories or personal reflections, and is also the most effective way to provide important background and factual information. 6. Music, of your choosing, can be a nice way to personalize, enhance, and liven up the silent film images. When chosen and mixed carefully with the pictures, it can completely transform the viewing experience. 7. Still images can be made from any frame of film. These images can become unique additions to your photo albums, and are most often used as the label design to print on the DVD, or as the basis for a slide show that makes for a nice bonus at the end to re-cap the film presentation. This 3-minute excerpt shows a glimpse of West African Tribal life as it was before Civil War ravaged small tribes such as this one a few years later. 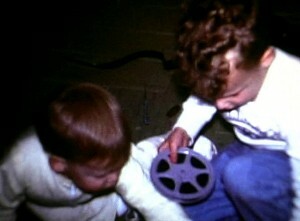 The project came to me as several small reels of super 8 film and a handful of audio cassettes. After converting everything to digital, I made a initial reference DVD of the silent film, as well as audio CDs from the cassettes. After a thorough review of both by the film maker, I had instructions to combine the appropriate segments of sound and picture. Up until that point I had found both recordings to be interesting, but a bit too chaotic and seemingly random to make a deeper impression. That all changed when sound met picture. The footage came to life much more vividly than I had expected. What had seemed like exotic but otherwise typical amateur recordings had suddenly transformed into living history. After some experimentation with placement and editing, the somewhat distorted and jumbled sound that I had found difficult to listen to now seemed to fit right in as if it was recorded that way. The client was thrilled to know that she could narrate the film in real time while watching it, so she prepared notes from from the DVD and her own diaries. A lot of customers initially think it would be too elaborate or fancy to narrate their old home movies, but it’s very easy to do and is the most effective and personal way to transform the silent images from an entertaining curiosity into a meaningful experience. The added context and colorful stories of this narration make the people and places real again, which is a sentimental reminder of journeys past, and a fitting tribute to old friends. Steve – just viewed the wedding DVD and I couldn’t be happier. I know that the flaws created by the movie taker so long ago can’t be changed but you were able to lighten the indoor footage significantly and I’m seeing folks that I hadn’t been able to see before. …This is the only movie I have of him [my late husband] walking – that’s why it’s so very precious to me – a great guy. Thank you for your talent and the attention you gave to this project. Steve, as I said in my phone message, the dvd is totally awesome!! I can hardly wait to watch it again!! Your dvd is so much, much better, there is no comparison!!! The music sure beats the elevator music on the Sears tape, too…Randy was also happy that I had you make an extra copy for his dad. Since I had the original reels, his dad has probably not seen any of them since 1979! Steve, the downloads are great and the Indy Speedway Museum wants copies!